Pope Francis, head of the Catholic Church, showed true world leadership at the weekend​. He visited the Greek island of Lesbos, and rescued a dozen Syrian Muslim refugees by taking them home with him to the Vatican City in Rome. It was a hugely symbolic gesture even for the Pope to go to the Island of Lesbos, which is full of desperate refugees. By also rescuing three destitute families seeking asylum, the Pope demonstrated true compassion from which our own political leaders could learn. During the flight home yesterday Pope Francis said, "All refugees are children of God,” adding that his actions were “a drop in the ocean". One of the refugees saved by the Pope, Hasan, an engineer from Damascus, told Italy’s La Stampa newspaper, “We saw friends and relatives die in the rubble, we fled Syria because we no longer had any hope”. As a result of the Pope's intervention, Hasan arrived in Italy with his wife and two-year-old son, and two other refugee families. Hasan described the Pope as their saviour, and explained that his family had felt trapped on Lesbos, along with thousands of other people seeking refuge there. “There were so many children. Some of these children witnessed their parents and friends dying, drowned at sea. I saw such suffering,” he said. He went on to tell of one particular case, “that of a young man, who was not even 40”. “I met him yesterday with his two sons. He was Muslim and told me he had married a Christian, [and that] they loved and respected each other,” he said. The arrival of the three families rescued by the Pope brings to about 20 the number of refugees now living in the Vatican, which has a population of less than one thousand. If Britain provided asylum to a similar proportion, it would mean accommodating 1.2 million refugees. Nobody is proposing that Britain should or could rescue that many, but our government's plan to take in just 20,000 Syrian refugees in the next four years seems pathetic by comparison. Britain has also refused to participate in an EU scheme to take a fair share of the refugees who have fled to our continent. Last year, the Pope appealed to every Catholic diocese in Europe to take in a refugee family, an appeal that has largely been ignored in most parts of Europe. The numbers arriving in Greece has fallen considerably since Turkey agreed to take back many of them, in return for billions of EU cash and other concessions. But in my view, the EU cannot salve its conscience by buying its way out of the world’s worst ever refugee crisis. Over one million people have made the perilous sea journey to Greece since the start of 2015, with thousands drowning on route. As I have consistently reported, the vast majority arriving on the Greek islands are genuine refugees fleeing from war, oppression and violence mostly in Syria, Iraq and Afghanistan. “The approximate recognition rates in the EU for Syrian asylum seekers is around 95 percent and for Iraqis and Afghans it’s over 70 percent. Britain, and the rest of Europe, should be doing much more to help people trying to escape from the most terrible, shocking, heart-rending circumstances. 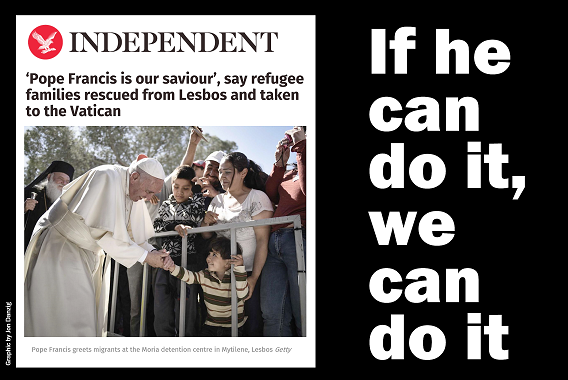 If the Pope can do it, we can do it. Refugees: Is it them versus us?